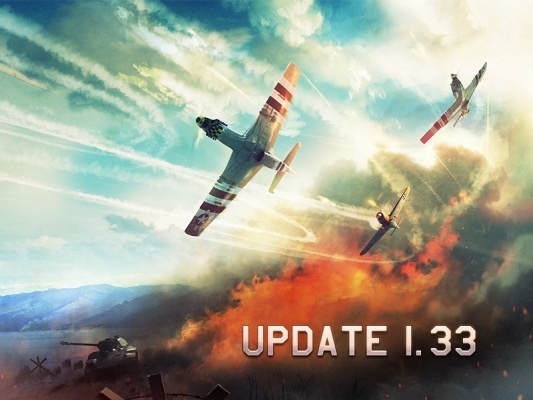 Difference between pages "File:CountryIcon KOR.png" and "Update 1.33"
[https://warthunder.com/en/news/226--en Update 1.33] ([https://forum.warthunder.com/index.php?/topic/53226-war-thunder-update-133/ changelog]) was introduced on 7 August 2013. It is most notable for adding [https://warthunder.com/en/news/221/current/ Modifications and Consumables] to the game, along with a wide range of new armament options for aircraft. * The whole rendering system has been optimized, the whole rendering process has been made faster as well as rendering for grass. * Lots of new modifications for different planes. Almost all the modifications are upgrades for the planes, replacing old, worn parts with new ones ….. Some modifications are different, but they are the minority of what is planned (eg lendlease fuel, rear armor plate replacement). * Shell racks are now consumables and should be replenished. * Ammo, rockets, torpedoes and bombs are spent after they are used in battle, not after the battle is over. * When hitting with no damage – player won't receive rewards, but will get the message that no damage was done. * If your premium is over, after the battle is over in a debriefing window you will have an opportunity to buy premium for a week and thus get all the rewards you should receive if you were playing with premium. * You have an opportunity to buy modifications with golden eagles. * Rockets for German and American planes added. * No air kills will be awarded with air collisions. * Requirements for unlocking skins and decals have been changed, option to buy any skin/decal with Golden Eagles added. * All externally carried armament (rockets, bombs, torpedoes and cannon pods) has been adjusted so that they affect aircraft performance more historically correct. * Damage of Mg’s and cannon shells increased, damage caused by the real kinetic energy of a shell is more accurate. * Flame protection modelling/simulation is added. After a fire outbreak in the engine area, the pilot is not injured while the fire seal is whole (20 seconds). * New bomb load options for Ju-87B2, Ju-87R2 , Ju-87D3, Ju-87D5. * New bomb load options for Ju-88A4. * New bomb load options for IL-4 including external load. Overall bomb load can reach up to 2 tons. * Fuse for incendiary shells for МК-108 and МК-103 has been fixed. When hitting oil tank shell has a good chance to cause denotaion of the tank and aircraft explosion as a result. * M23 and M20 bullets are available for the aircraft that served during the end of WWII and after. * Ruestzustand 6 (R6) rockets for Fw-190A-5 - 2 rails under the wing panels. * Penetration issue for 20mm AP-I shells for ShVAK fixed. For 50 m distance it is increased from 20m to 30 mm. * For all gun and rocket pods armament (rockets, bombs torpedoes and cannon pods) - their aerodynamic resistance affects performance of the aircraft. * Stalingrad winter: 3rd airfield is added, amount of tickets for both teams is increased. * Zhengzhou. 3rd airfield is added, amount of tickets for both teams is increased. * Peleliu. Ticket loss speed is reduced if both teams have captured airfields. * Mozdok. Ticket loss speed is reduced if both teams have captured airfields. * Cliffed coast - spawning points for the teams is changed to improve balance. * Stalingrad - spawning points for the teams is changed to improve balance.